It’s hard to believe as I write this that March is almost over, that daylight saving will end soon and the next thing will be Easter. I remember the very hot days of summer but still, wonder where the time went. We just have to make the most of our days when it’s not too hot (or too cold) to go out and get things done. 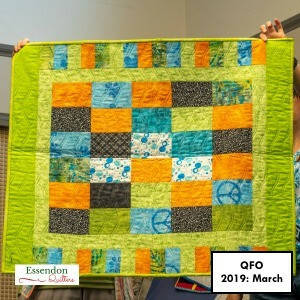 Our night meeting with our special guests from the Melbourne Modern Quilt Guild was most informative and inspiring. Sandra, the President, explained very clearly the definition of a modern quilt, as distinct from art quilts. 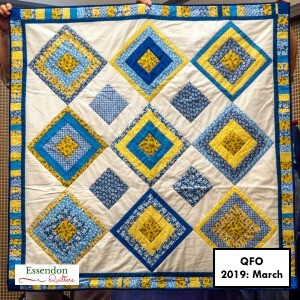 Then she and Catherine showed us many of their wonderful quilts which were examples of their use of colour and pattern with lots of hand stitching. Especially memorable was Catherine’s heart quilt made by her friends for a special birthday. 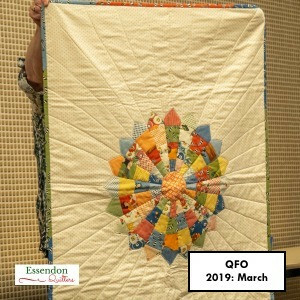 Kathy’s work in progress was a Jen Kingwell Halo quilt. Members were also impressed by the backs of these quilts showing what you can do with bits and pieces of fabrics. We thank Tamara for arranging this really special event. 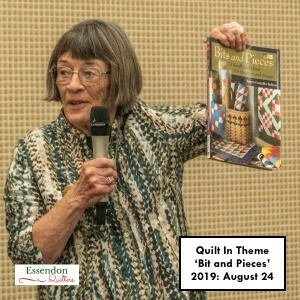 It was a stand out success and I’m sure Tamara will be asked many questions and be given many comments now that we all know so much more about modern quilts. 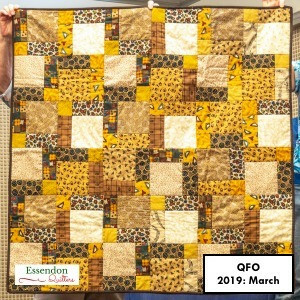 In April at the day meeting, we have Kerrie Thomas, a long arm quilter to speak to us. 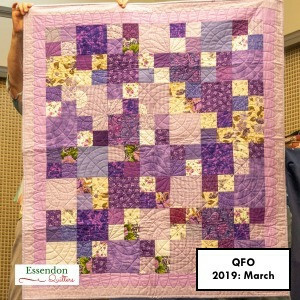 Many of you will have already seen her work on the raffle quilt for the Biggest Morning Tea in May. Preparations are underway to make this a special morning tea and we ask members to please bring a plate to share; family names beginning with A-L savoury, M-Z sweet. In June we have our 30th Anniversary Lunch and Denise will have the card machine from the bank to make it easier for you to pay. Preparations are well underway for the August Quilt In which Barb P and I are going to co-convene. Two hands are better than one they say and our third hand belonging to Pat B has not been still for a moment with heaps of little goodies already made as gifts. 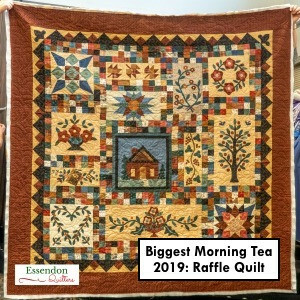 We thought we would depart from the usual sewing machine or quilt as raffle prizes and opt for two or three or even four smaller prizes. Any thoughts as to what these might be would be most welcome. Just have a word in Barb’s ear or mine. One idea was to have one of those really classy irons. In a way, we are copying Vic Quilters last Quilt In. 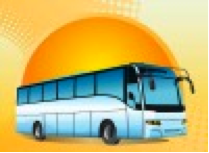 Which leads me on to the bus trip. Everyone who went said it was a great day, the shops were great, there weren’t too many speeches and there was a lovely peaceful, friendly, relaxed atmosphere. Nadine deserves our sincere thanks for doing a terrific job organising it and Denise needs to tell us the secret to winning not one but two raffle prizes. Finally, our thanks go to Maureen D for all her help and enthusiasm in our QFO circle. We hope her arm heals quickly and she can get back to making those prize-winning challenges. Barbara P has put her hand up to head up QFOs into the future and she too will get lots of support. Meanwhile, keep on cutting up those little bits of fabric and sewing them back together! We hope to see you at our next meeting which is just before the Easter break.